In this last installment of our Frugal Holidays series, we’d like to talk about frugal gift buying (Part 1 Frugal Holiday Entertaining, Part 2 Frugal Holiday Food). Gift buying can be fun but during years when savings accounts are not as plush as we’d like, 401k balances are still struggling to make a comeback and jobless rates remain uncomfortably high, gift buying becomes a dreaded activity that hurts our wallets, self-esteem and holiday spirit. That’s why committing to a frugal holiday is so important. Not only do you remove the Herculean weight of the stress that deep-pockets conformity brings but you also turn the holiday into a fun mission, an exercise in conservative spending, and a lesson in being grateful for what we have instead of obsessed with what we want. So here are just a few tips to keep your holiday gift buying fun AND frugal. You can buy big discount packages of body wash, candy, body sprays and many other products. If you buy these large packs and wrap each of the items inside individually you can save money and give great gifts to coworkers and family members. Instead of buying a present for every person in your family, you can each enter your name in a basket and then draw someone else’s name out. That way you can significantly reduce your spending, still buy a really great gift for one member of your family, and make sure no one is left out. Let’s face it, holiday presents are not usually about what you need—they are about what you want. Instead of rushing out to buy the newest gaming system, most expensive running shoes and latest designer purse for your loved ones, how about buying college textbook gift certificates, grocery store certificates, and practical necessities like batteries? Not only will you save money by setting a limited budget for these gifts but your gifts will be used long after the holiday is over. 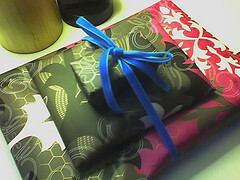 Shannon did a great post on creating your own holiday gifts this year. Not only are her ideas frugal, but a homemade gift really comes from the heart and can be more moving than the most expensive piece of store bought jewelry. There are so many charities and people in need right now that you could halve your usual holiday gift budget and give the money to a charity instead of buying gifts. If you make an effort, you can also use that as a great lesson for your children. If you normally spend $500 on holiday gifts, instead just take $250 and bring your children grocery shopping for food to donate to the local soup kitchen, pet supplies to donate to your local animal shelter, or sleeping bags, blankets and clothes for the local homeless shelter. Bring your children with you when you make the donation and help them understand just how lucky they are—even without a Wii under the tree. I have another frugal suggestion. It involves giving a charity gift card. Check out http://www.TisBest.org It’s the only site dedicated exclusively to charity gift cards. The cards are totally customizable and they’re beautiful. Perhaps this is stretching the definition of “frugal” a bit, but even a $10 or $20 charity donation is meaningful (and important). That’s a great suggestion Jon–I hadn’t heard of them before but just checked them out. Seems like a great program! Stamps. Fancy stamps cost the same as the boring stamps, but they seem to make my mom happier…. go figure.